Here I am, once again on a Saturday, wasting time....well, maybe not "wasting time" - let's call it getting inspired. Yes, that sounds so much better. Art Spirit - I see a few pincushions I'd like to jab at the most recent post! A dye-your own yarn store? What an amazing idea!!! Joining Mothers of Organic thanks to The Mother Load. Why have 400+ people looked at my [not very expensive] house necklace at http://www.tamdoll.etsy.com/ but not purchased it???? Now here is something that's making my fingers itch to go create!!! 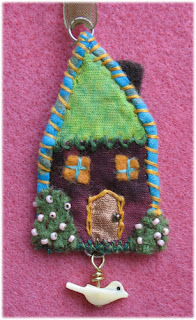 Enjoying this felt embroidery... thinking of some more valentine's projects!Saving this to view later on - wow!!! I can see things in 3-d when I get doll ideas in my head, but this is so clever for those tough-to-figure-out projects. I may have to try this with one of my kid's drawings. I've been reading The Toymaker and enjoying it so much, will probably finish it this evening.